I've followed and admired Seth Godin's thinking for some time already. I guess I'm not the only one, since he seems to be one of the most followed person on the web. What I like in him, are the surprising angles he looks at things, almost magical ability to group things together and he's way of presenting his thoughts. 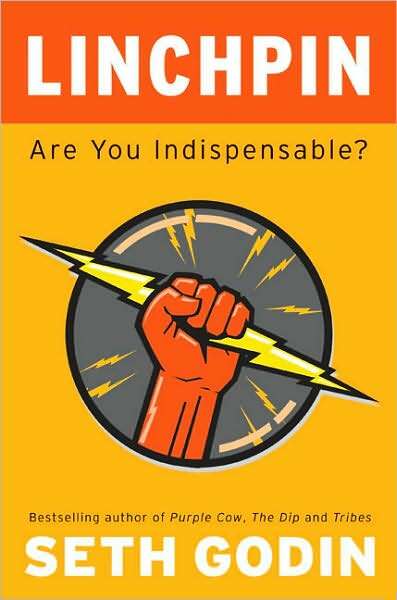 The book Linchpin - Are you indispensable? tells about people who make value to their work over their job description. It's about those who have skills that are hard to describe. It's about those who are not easily replaceable by anyone else. It explains those people, what are their skills and how they behave. What's best is that it also analyses what it would take for any of us to become indispensable. In the book Seth Godin describes these people linchpins. Also he describes those as artists, people who create something different with their behavior and skills. He gives good examples of linchpins as people who make others feel comfortable and well served or someone who truly cares about the result, not only about doing their job. 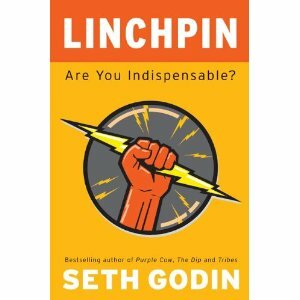 In this book Seth Godin talks about how to become a linchpin. He explains how our lizard brains prevent us doing many things, how connections are important, why gifts has a such an important role in current world and economy and lot more. It is an extensive and brilliant insight to why some people just make things happens and others just stick with what they are told to do. Many times during the book I noticed of things I could do differently and things I should continue to do even more. Like Seth Godin says in his book, it's not going to be easy to become linchpin, but it's most probably up to you. There's something in you that makes you special, you just need to really learn to use your skills. I've always admired Seth Godin for his ability to say things in compact, even short, form. His blog posts and some of the previous books I've read are carefully shortened to give a clear and simple message. This time it's different. Book is not that compact and I could even say that it's not organized in such a smart way as he normally does. I got the feeling that the subject in question might have been such an important for him, that he might have not been able to really analyze his own doings so well, than with less important subjects. That's at least what I've noticed, what closer the subject is to your heart, that harder it is to subjectively analyze it. It's a brilliant book, but it's not easy to read. Or the text is easy to read, but some of the ideas are such new and bold, that it takes some chewing to really understand meaning of all of those. To read it, it's for everyone, but I believe most of the people don't really take all of it seriously. I liked it and I hope I have the guts to take in to use the things I figured out during this book.